For an unparalleled experience, a visit to the mountain desert of Nubra Valley is a must. 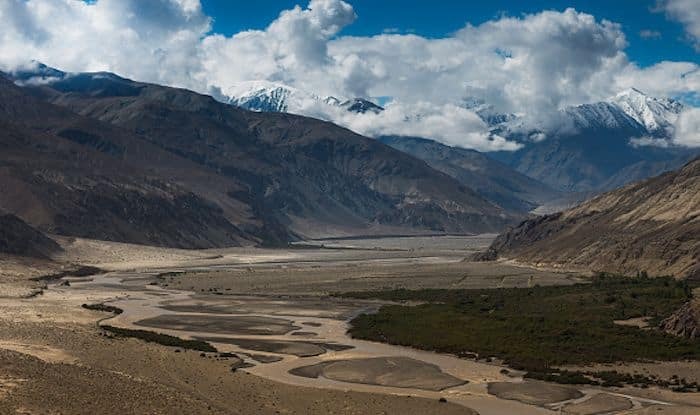 Nubra Valley is an epitome of beauty; the vast expanse of arid mountains and fertile river beds is what makes it so unique. Also known as Ldumra which means ‘The Valley of Flowers’, Nubra Valley is located at the confluence of Shyok and Siachen rivers. Perched at a staggering altitude of 10,000 feet above the sea level, this valley acts as a demarcation between Ladakh and the Karakoram Range. One of the things that is exclusive to Nubra Valley is a camel ride at the Sand Dunes of Hunder, which is about 150 kilometres from Leh. Sand Dunes of Hunder is unmissable; it’s rare to find sand dunes at such high altitude. Additionally, the two humped Bactrian camels are not found anywhere else but here in the country. The lake os Yarab Tso is also known as the ‘Hidden Lake’ owing to its isolated location. It’s a challenge reaching there; you need to hike uphill for 15 – 20 minutes from Diskit village to reach the lake. Surrounded by lush greenery, the beauty of this lake is a delight to the senses. There’s an unparalleled joy in traversing the undulating mountain ranges and sprawling valley of Nubra. You can choose from different levels of trekking options and also opt for camping along the bank of a mountain river to spend some time in true solitude amidst nature. Touted as the world’s highest motor-able road at 5,602 meters above sea level, riding a bike through Khardung La should be on your list. Colourful player flags flank both sides of the road, and the stunning beauty of this place makes it worth every bit of your effort. Among the many Buddhist monasteries here, Diskit is the oldest and plays the role of a sub-monastery to Thiksey Monastery in Leh. For a breath-taking view of the valley, a visit here is highly recommended.